The trail began an extension in 2006 to bring it all the way up into Riverside and San Bernardino counties, but the current trail, which has been popular since the 1970s, runs through or near Yorba Linda, Anaheim Hills, Anaheim, Villa Park, Orange, Santa Ana, Garden Grove, Fountain Valley, Costa Mesa, and then deposits cyclists — just like the old river — right near the opening to the ocean between Huntington Beach and Newport Beach. The ride curves in and out of highly urbanized areas, then park-like settings. 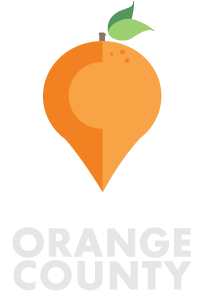 There are plenty of rest stops, small parks and restrooms along the way, right on the trail, and quite a few places to stop for a picnic if you wish. The paved trail is wide enough to ride comfortably side-by-side, allowing you to chat with a friend or share knock-knock jokes with your 7-year-old. And its protection from the street means you don’t have to worry about oncoming cars. There are numerous gates to enter and exit the trail throughout each city, so you can ride just a short leg of it or ride the whole thing. Nowadays the riverbed runs dry through most of the summer (although you might get some flowing river in the eastern part, through Yorba Linda and Anaheim Hills –complete with marsh-water birds such as beautiful heron). In winter and spring months, the riverbed is full for a longer stretch of the ride toward the ocean, providing pretty scenery. If the idea of riding to the beach sounds appealing but the idea of trekking home doesn’t, you can always take the bus back. Each public bus has an easy-loading rack to accommodate two bikes, so you can zoom down to the beach in the early-morning hours and not have to worry about the long haul home. Visit www.octa.net for bus schedules and bike-loading information. If you’re up for the full 30-mile ride, good places to access the beginning of the trail are at Featherly Regional Park, off the 91 Freeway at Gypsum Canyon Road (the bikeway runs nearby; county-park fees are $2 on weekdays and $4 on weekends), or a little further west right off the 91 Freeway at Imperial Highway and La Palma (the bikeway is accessible alongside the Aaron Bros. shopping plaza; parking is free). 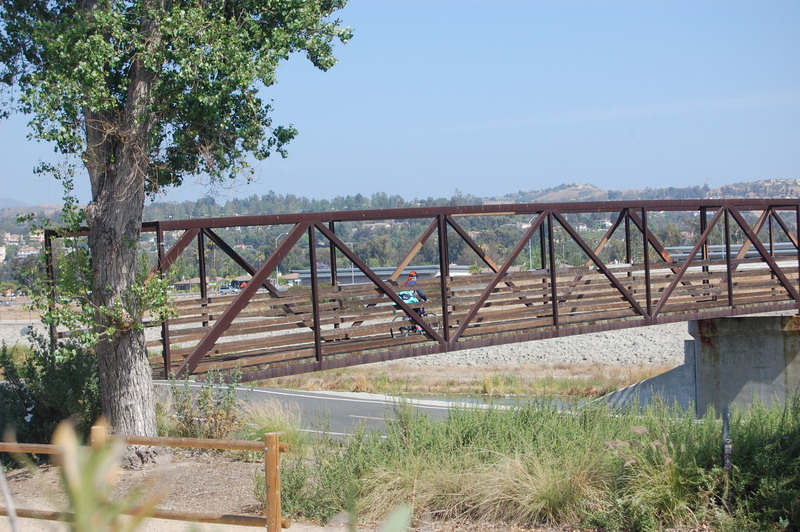 For photos, more information, and an interactive map of the trail, visit the Santa Ana River Trail website. Where to park: Good places to access the beginning of the trail are at Featherly Regional Park, off the 91 Freeway at Gypsum Canyon Road (the bikeway runs nearby; county-park fees are $2 on weekdays and $4 on weekends), or a little further west right off the 91 Freeway at Imperial Highway and La Palma (the bikeway is accessible alongside the Aaron Bros. shopping plaza; parking is free). 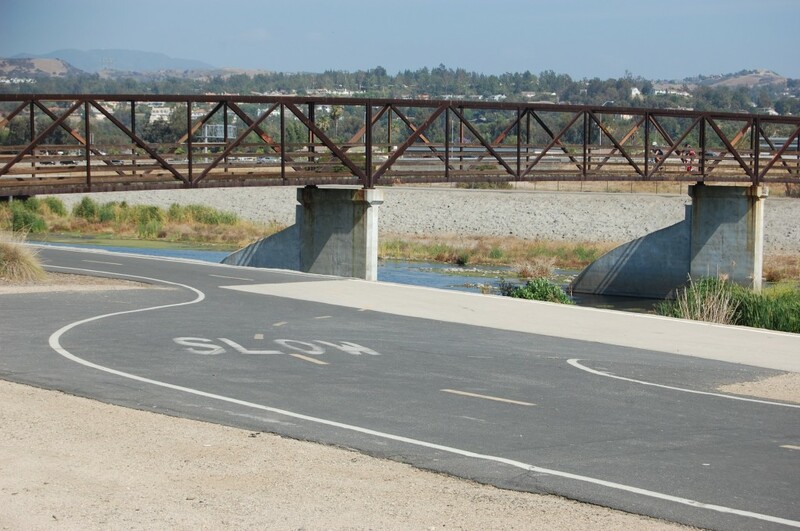 For places to access and park along the trail, visit the Santa Ana River Trail website. What to bring: Water, sunscreen, picnic if you wish, bus schedule if you’re taking the bus home, towel if you’re dipping your feet in the ocean when you arrive. Dress in layers. For more information: Visit the Santa Ana River Trail website. Have you ever ridden the Santa Ana River Trail? Have any fun tips to share?